NAP TIME: THE TIME OF DAY WHEN STAY-AND-WORK-AT-HOME MOMS CO - ProudMummy.com the Web's Community for Mums. 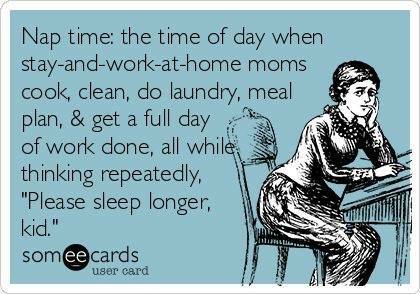 NAP TIME: THE TIME OF DAY WHEN STAY-AND-WORK-AT-HOME MOMS COOK, CLEAN, DO LAUNDRY, MEAL PLAN, & GET A FULL DAY OF WORK DONE, ALL WHILE THINKING REPEATEDLY, "PLEASE SLEEP LONGER, KID." Full-time working mums have to do all that after bedtime or at weekends.